Gene Allen of KTVI posted this earlier today. 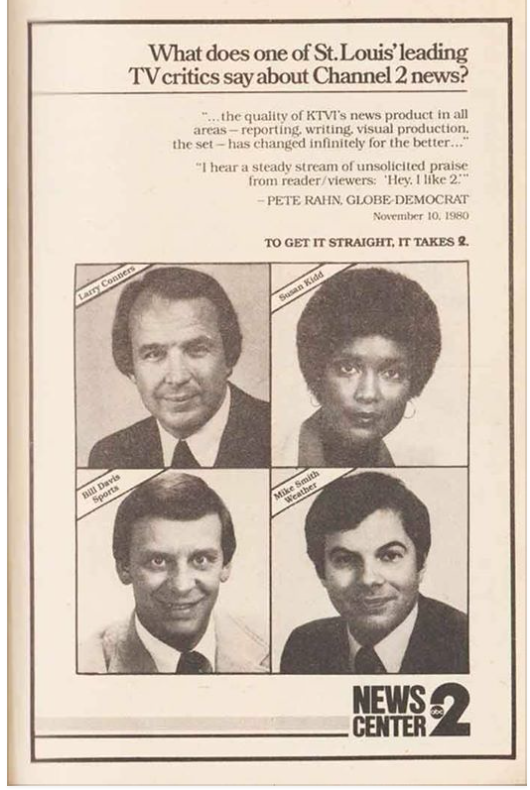 It is a full-page newspaper ad from my days in St. Louis. Yes, I had hair then! 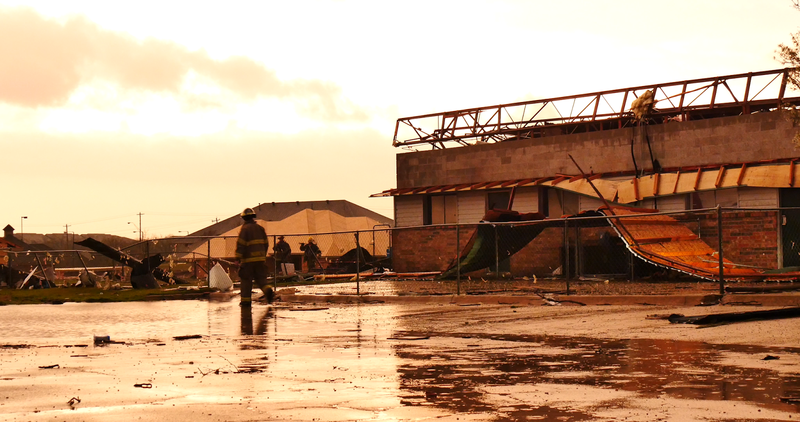 Wednesday's Moore tornado has now been rated EF-2 intensity by the National Weather Service. 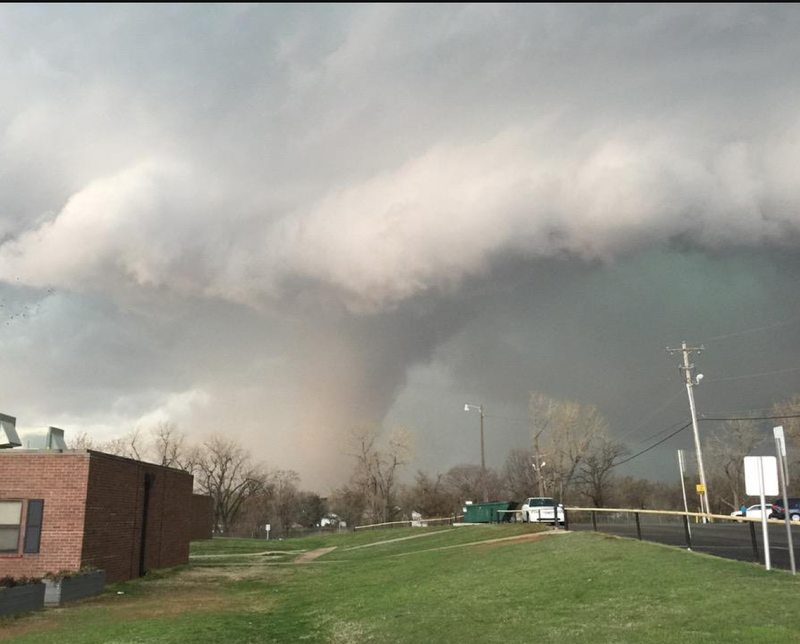 There were two EF-2's in Oklahoma that day, including the fatal Sand Springs tornado. was able to issue a tornado warning a full 15 minutes before the tornado touched down -- allowing our clients to take appropriate safety measures. Our report on this storm is here. 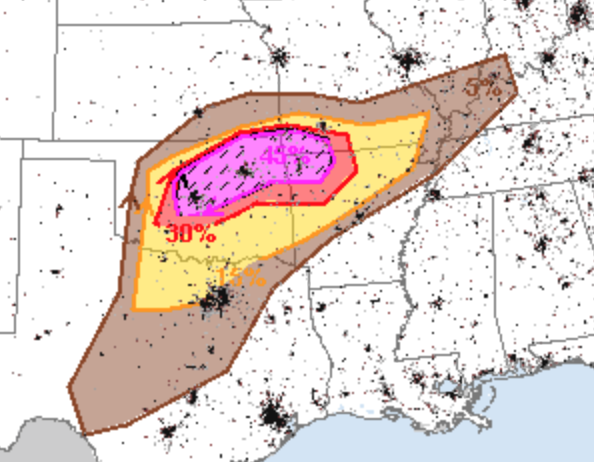 Essentially the area from Wichita to Minneapolis to Quincy will have a significant threat of large hail and damaging winds. A tornado or two is possible. 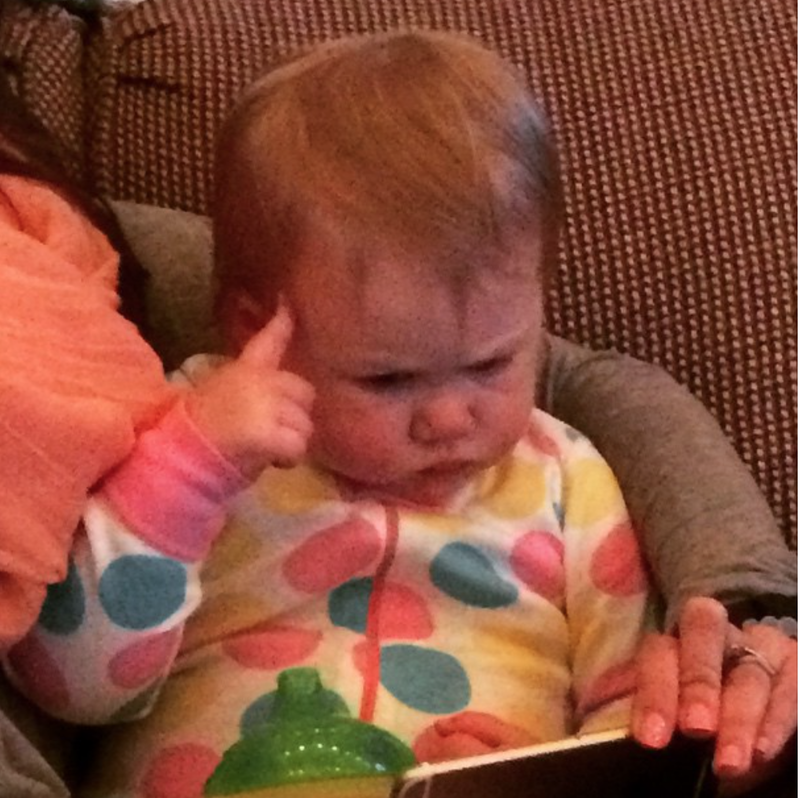 Forecaster Evie has been pondering the weather maps with a stiff drink of milk and she wants me to let you know this is going to be a difficult week. There are some indications there could be severe thunderstorms but this is a much more subtle situation than Wednesday's. So, keep an eye on the blog and we'll let you know as things develop. We have some tips, here. I'll continue to walk the path of science and be a deeply skeptical about catastrophic global warming, thank you. Ric Smith of the National Weather Service in Norman made a good point Wednesday morning: When a tornado watch is in effect, plan ahead to keep yourself out of traffic jams when the storms actually form. 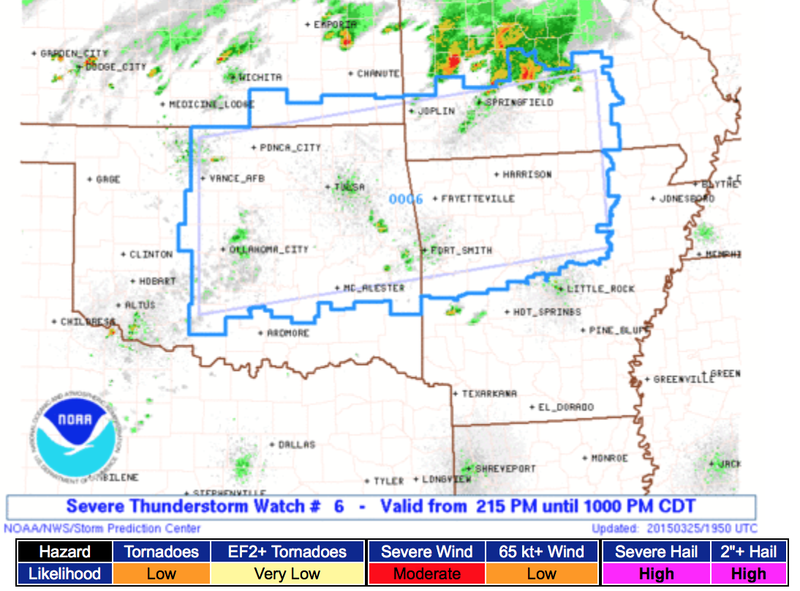 Watches are usually issued hours in advance of the storms. That is the time to adjust your schedule. 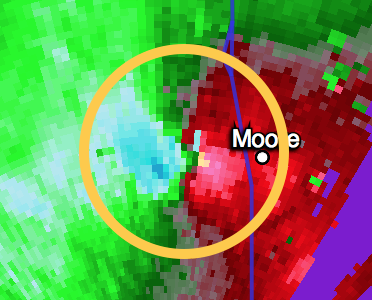 He the Moore tornado been slightly farther north, these people would have been in peril. Last week, there was media coverage of AccuWeather's new computer model that specializes in forecasting extreme weather. 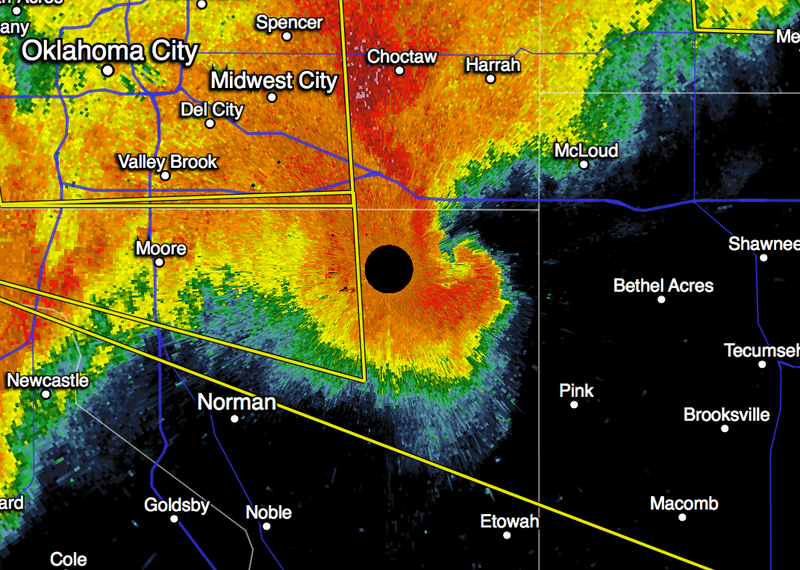 So, you might wonder how it did with yesterday's tornado in Moore. Answer? Amazingly well. It forecast two tracks of supercell thunderstorms capable of producing tornadoes across central Oklahoma. 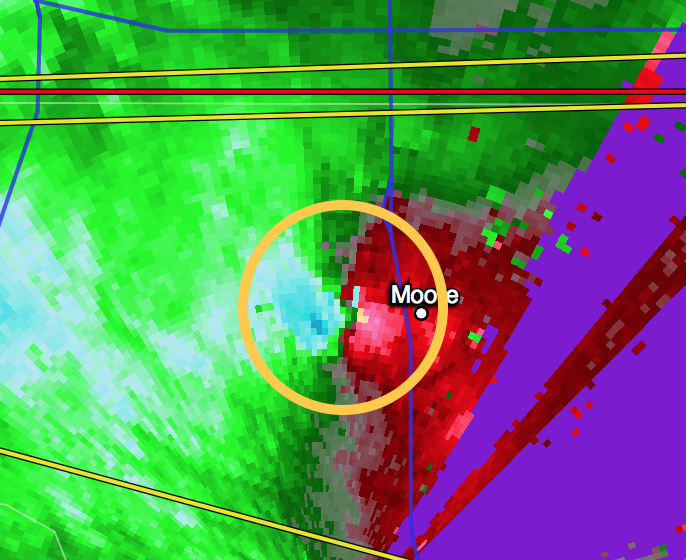 The southern track was quite close to Moore. This served to reinforce to our meteorologists that tornadoes were quite possible in central Oklahoma. 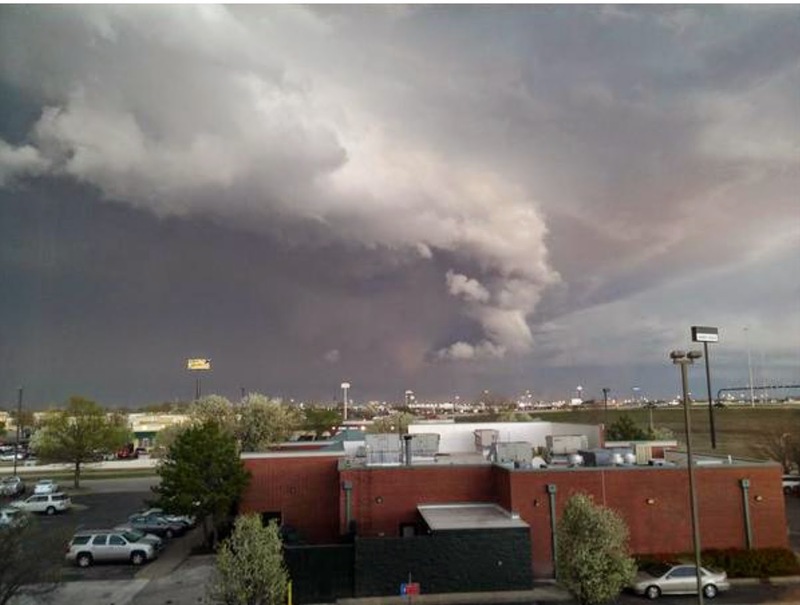 Our team did an outstanding job of warning our clients of the tornado itself. We have prepared a report and it is available here. What Did Microsoft Learn About AccuWeather's Services to our Clients? A fascinating white paper from Microsoft about how accurate, timely information is used by businesses to save people, property and profits. Our team did an amazing job with the Moore, Oklahoma, tornado yesterday and with other severe weather throughout the region. Read the paper and learn how your business can benefit by partnering with AccuWeather. 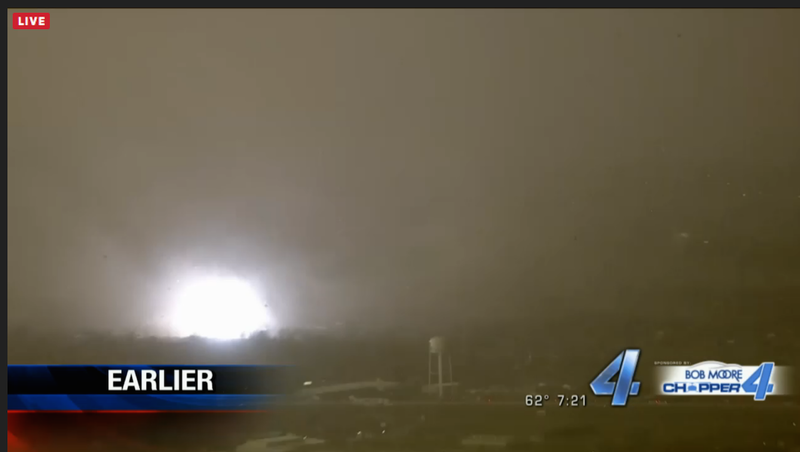 If you've never seen the coverage from the Oklahoma City TV stations during a tornado, it is amazing. This is from the CBS affiliate. KFOR (NBC) also does an outstanding job. Longer Tornado Warning Lead Times? BAD Idea! An Oklahoma representative wants to pressure the National Weather Service to issue tornado warnings one hour in advance. That is a terrible idea. Multiple, convincing studies demonstrate that 15 minutes is the optimal lead time for a tornado warning. Why? People will only stay in basements, bathtubs and closets for so long. More than 18 minutes, the death rate goes up. This is likely due to the warning losing its urgency. As we saw, twice, in central Oklahoma in 2013, people without basements will hit the highways, likely putting themselves in more danger with they have more notice. The false alarm rate will go up, possibly way up. The death rate (deaths per million population) has been cut 97% by the tornado warning system. A Nobel Prize-worthy achievement. Unfortunately, in an attempt to get at that last 3%, a lot of bad ideas have been implemented and proposed. Congress should vote this one down. Hope the storm coverage has been beneficial. There are still many severe thunderstorm warnings and flash flood warnings, so please continue to monitor the weather if it looks threatening in your region. Those who have lived in the Oklahoma City area for any length of time was familiar with the "KOMA" Radio Towers (now KOKC1520). It was three towers in a row west of Moore. Two were downed by the tornado and the third (picture) was damaged. Here is the radar at 7:29pm. 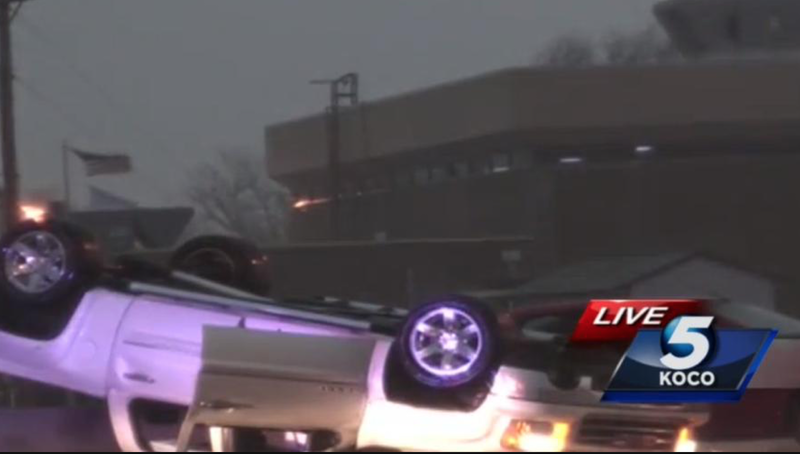 There is damage in the Tulsa area, primarily in the Sand Springs area. There are 10-12 mobile homes destroyed along with conventional buildings. There is just one tornado warning out now (red polygon) to the north of Talehquah. 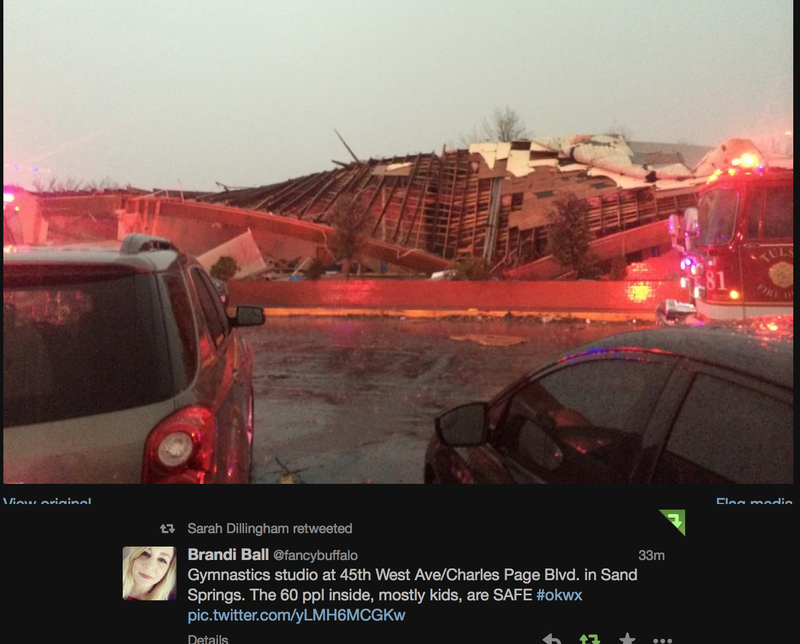 Below is a gymnastics studio that was destroyed in Sand Springs. All 60 children were OK.
We don't know the full extent of the damage in OKC and Moore. 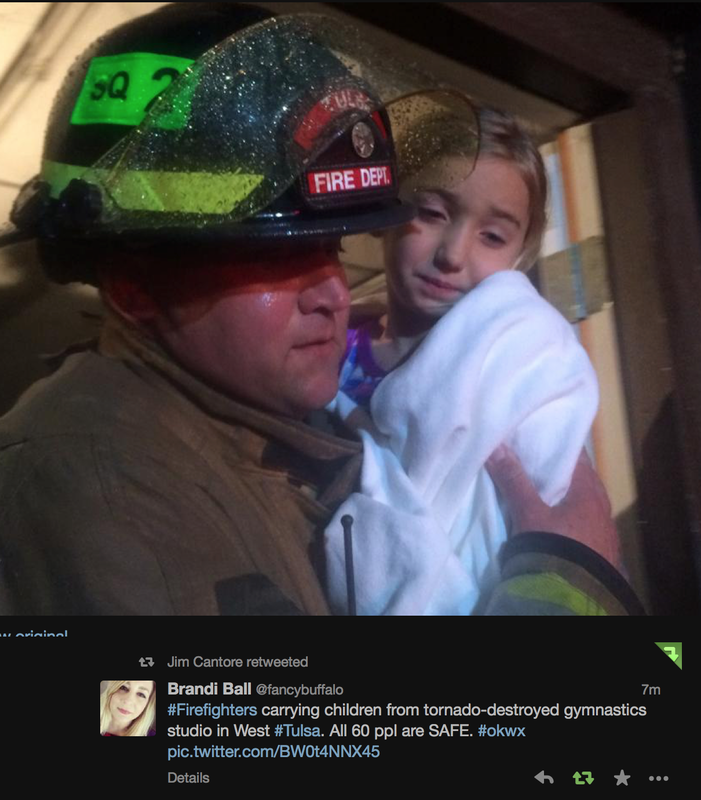 Here are a couple of photos via KFOR TV (my old station) and KOCO TV. Note the flag in the background. There are three minor injuries reported, so far. 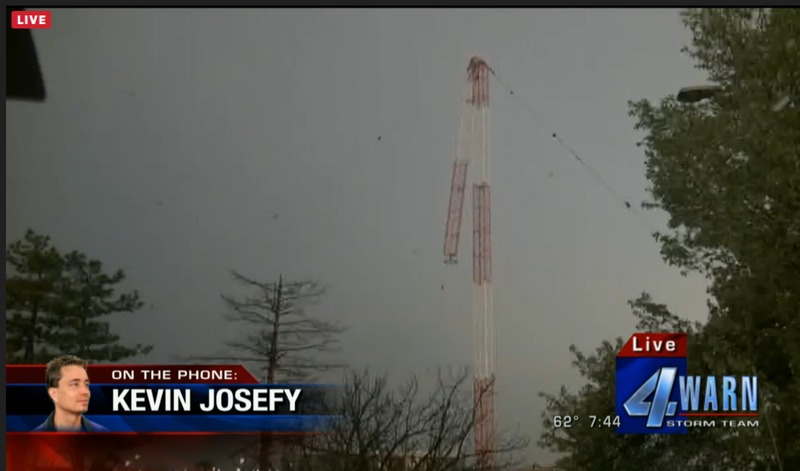 KFOR helicopter had video of the tornado with power flashes. RADAR at 7:06pm. Pronounced hook headed toward Shawnee, Pink, Tecumseh and Stella. There is a tornado threat this area. Take cover if weather looks threatening. UPDATE: 7:05PM, tornado threat near Stella with the threat moving ESE toward Tecumseh. Here are the radars as of 6:57pm. 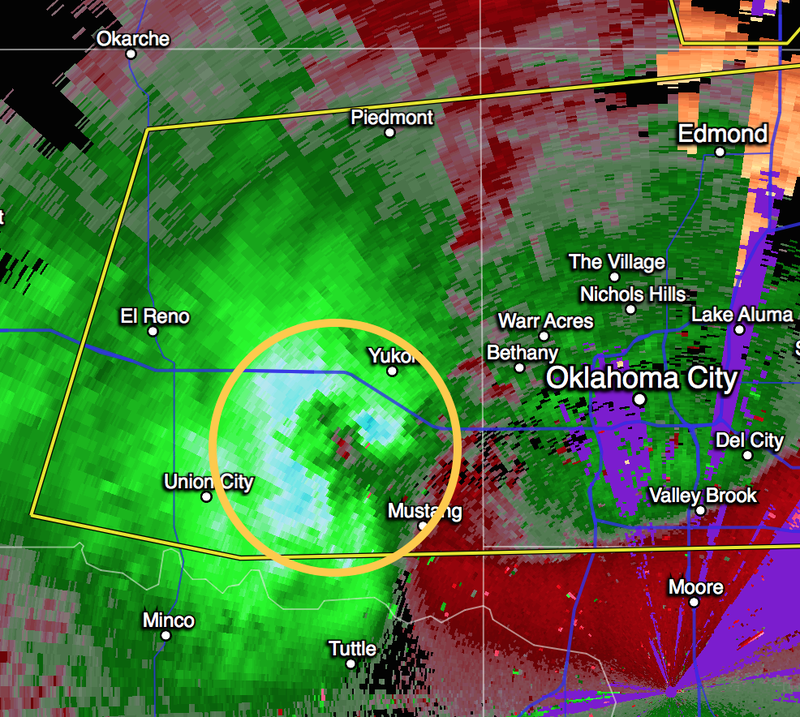 There is still a circulation east of Moore. People east and east southeast of the circulation should be prepared for the possibility of very damaging winds. 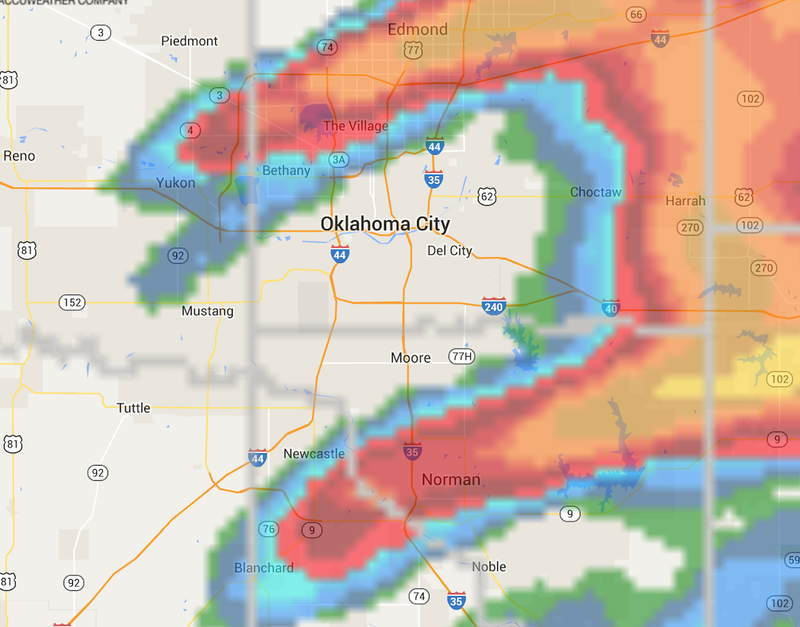 Tornado threat for OKC and Moore is over. Update 6:43pm. TORNADO WARNING = RED POLYGON. 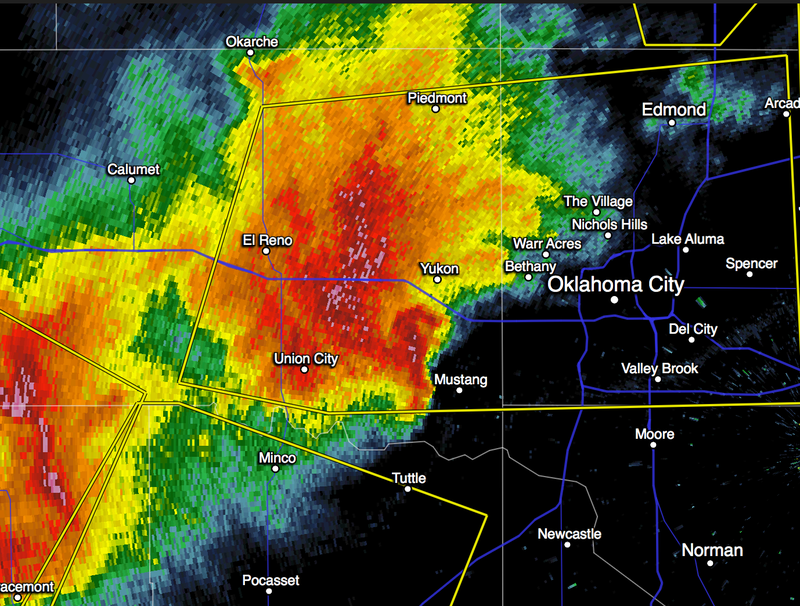 Includes Cleveland and Oklahoma Counties. I have circled one of the tornado locations. Purple and deep red is hail at the same time. Moving ESE. 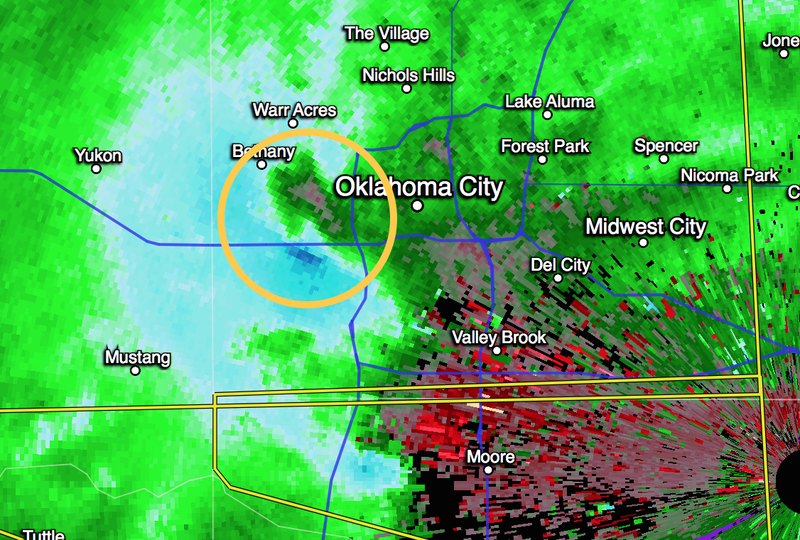 Above, I've circled the area with the potential for 70 mph wind gusts. Above, the area between Piedmont and Union City may have hail up to an inch or so. The storm is moving ESE. 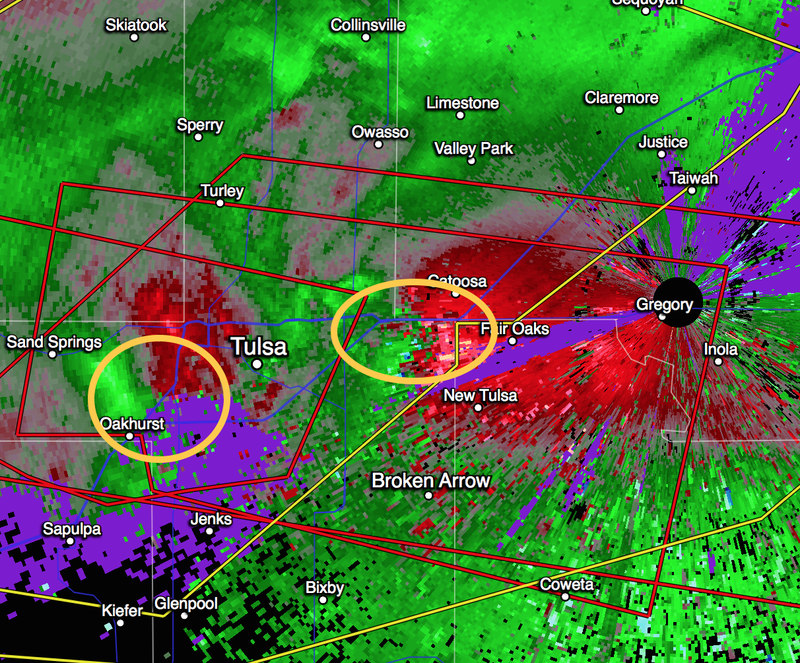 Two areas of rotation (circles). 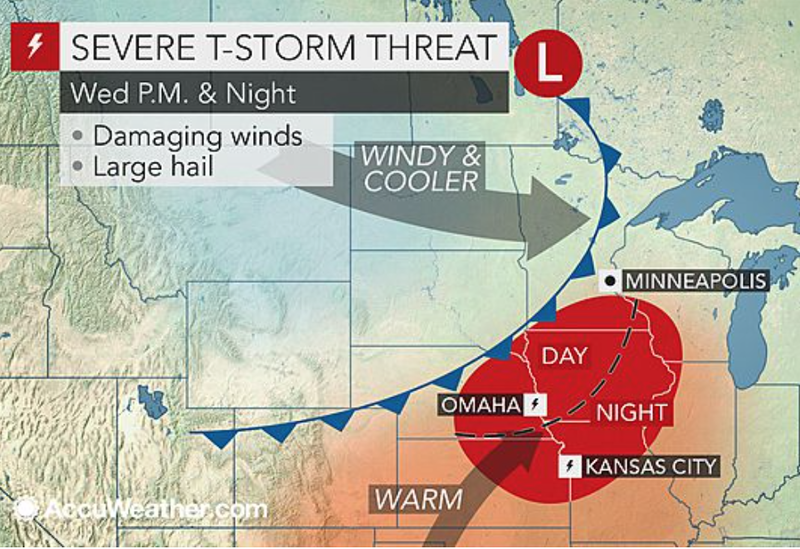 The one further to the east has produced at least two tornadoes with at least some damage. The areas enclosed in the red polygons are tornado warnings. The storms are moving ESE. Take cover in the polygons! Here is video of the hail falling at my home. 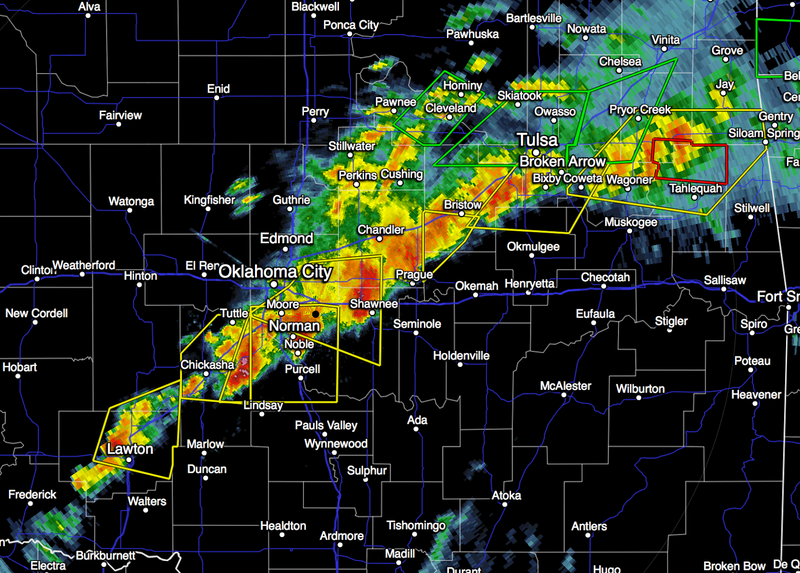 Tornadoes have been confirmed West of Tulsa and near Best, AR. Some minor damage (at least) has been reported. Very strong rotation north of Lotsee, moving ESE. Radar from 5:29pm. People near Oilton need to keep an eye on that cell, as well. Where the bright green/reds come together is strong rotation. 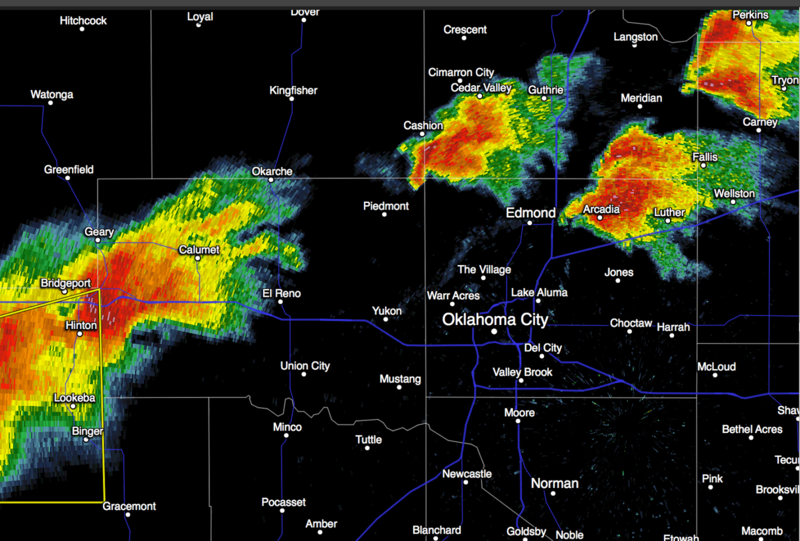 New thunderstorms are developing around Oklahoma City. 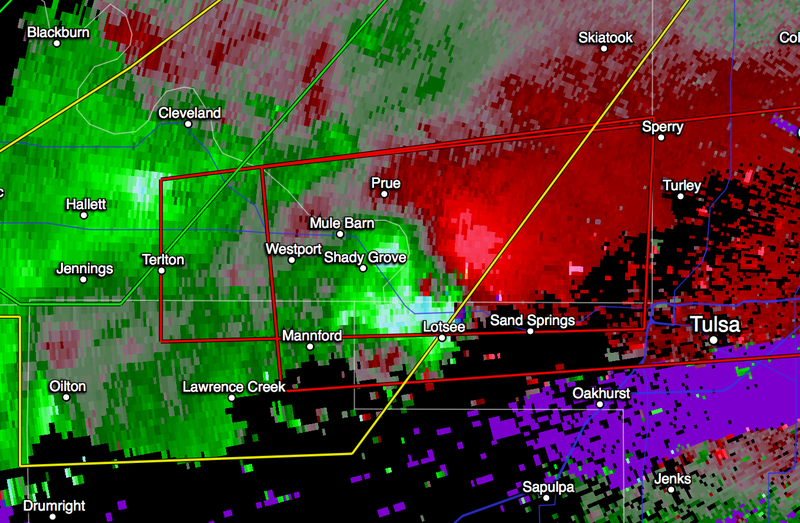 5:44pm via Twitter, tornado west of Tulsa. 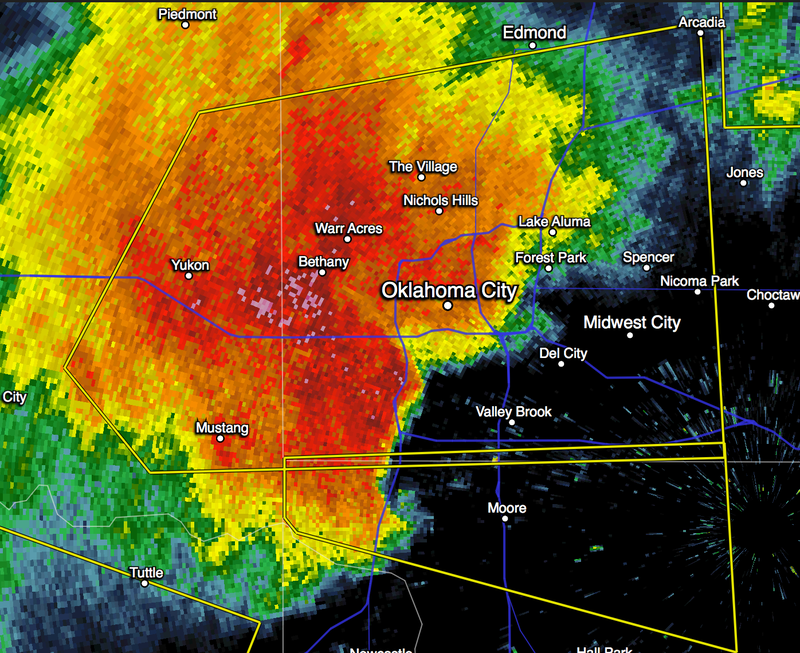 It would not surprise me if a few spots in Oklahoma received tennis ball-sized hail. Please keep the car in the garage and kids where you can quickly round them up. You may also want to bring in trampolines and other items that can be blown about. We can't rule out a tornado or two but this is not a major tornado situation. So, keep an eye on the weather if you are in the watch area. 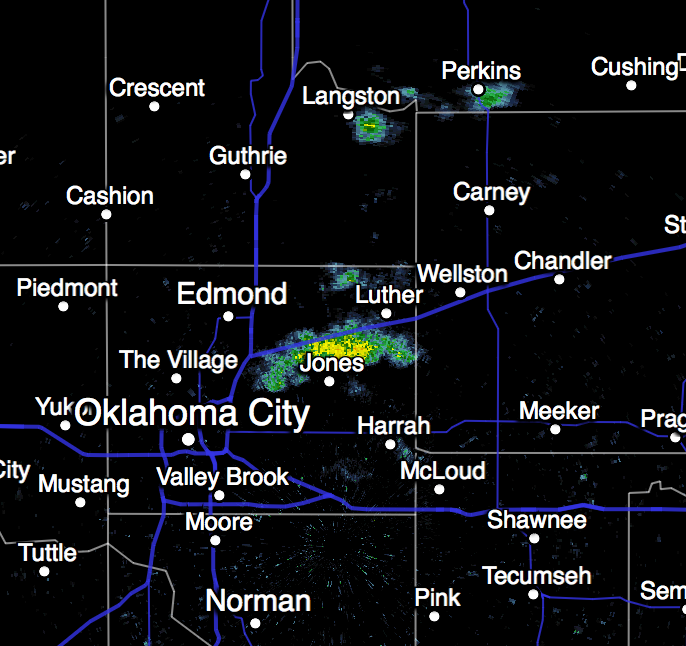 Thunderstorms are developing rapidly in Central Oklahoma as of 2:55pm. These are candidates to eventually cause very large hail. 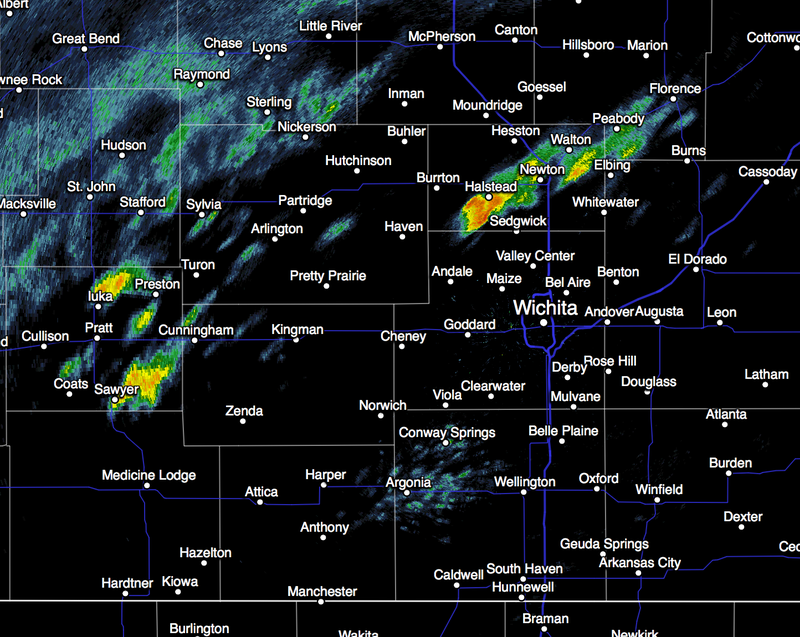 In Kansas, storms are present in the southern part of the state. Some hail is possible but giant hail is unlikely outside the watch. Storms with hail of 2" or more in diameter are doing to develop over a large area of the Southern Plains this afternoon and tonight. This is a day where you should keep your car in the garage and the kids close to home. You don't want them caught out in hail and lightning. 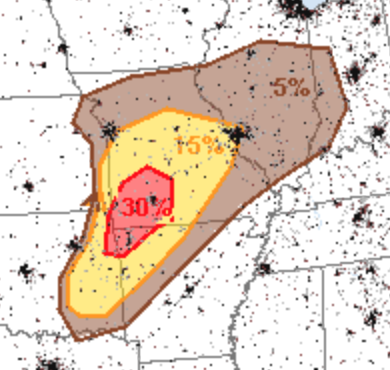 There is also some risk of tornadoes with the brown area being the threshold of a significant risk. That includes Oklahoma City, Tulsa, Fayetteville and Bentonville. If you live in these areas, please keep up on the latest weather information. I will have an update or two on this situation later today. AccuWeather will also be providing updates. 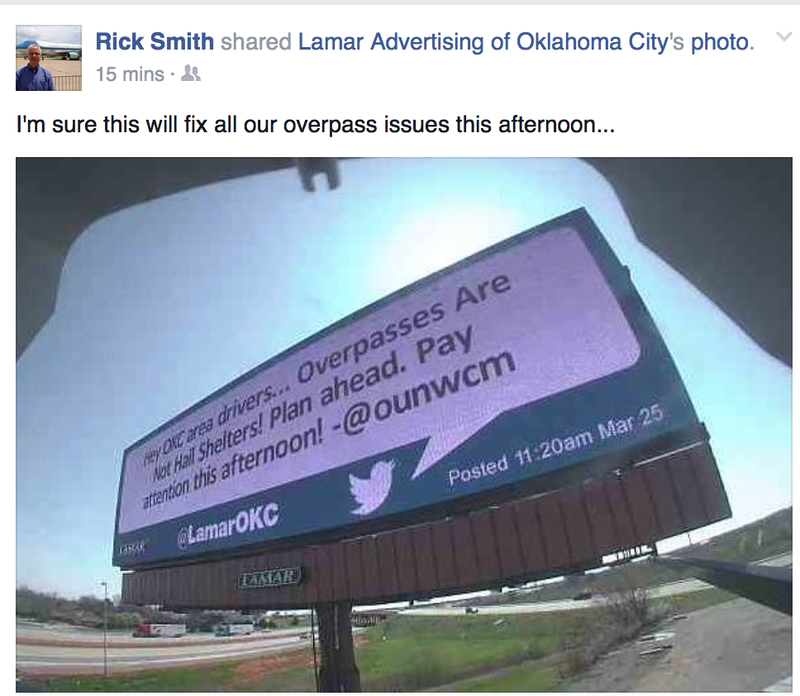 ADDITION: Very cool electronic billboard messages in OKC right now. The Federal Emergency Management Agency is making it tougher for governors to deny man-made climate change. Starting next year, the agency will approve disaster-preparedness funds only for states whose governors approve hazard-mitigation plans that address climate change. So far, the United States has a trend of fewer violent tornadoes and a record (nearly ten years!) interval without a major hurricane making landfall. So, if there is a trend associated with global warming, it is toward lessening storm disasters. FEMA withholding mitigation funds will increase the taxpayers' burden when a major disaster occurs, regardless of cause. So, this counterproductive strategy is nothing but blackmail. But, why would they care? It is our money they are wasting. UPDATE 7:11PM: Threat will be over by 7:18 or so in Diamond City and Lead Hill. Any threat of tornado has already passed but high winds from the back of the thunderstorm are still possible. 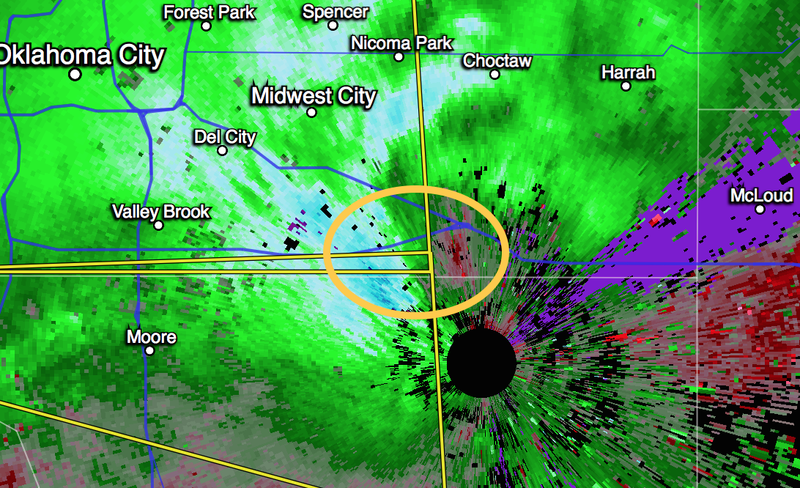 Very large hail is likely occurring on the MO-AR border (purple echo). 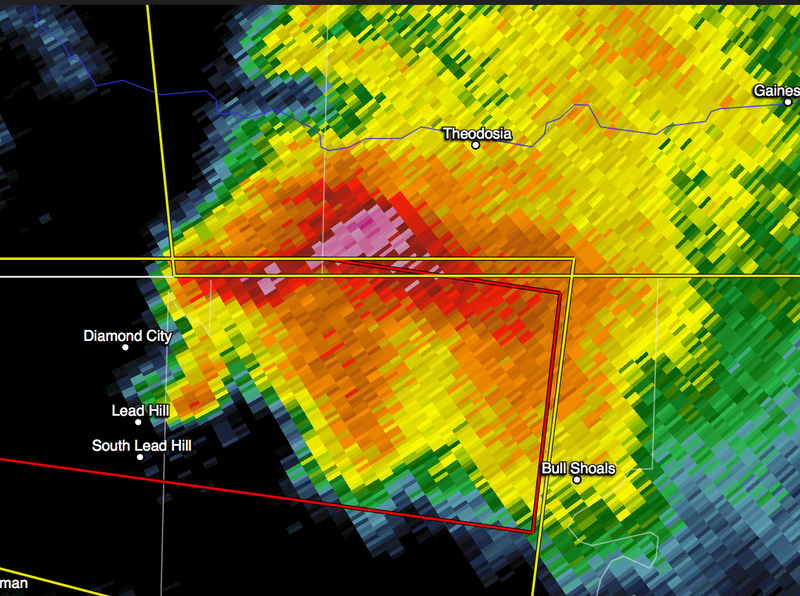 People in Bull Shoals, while not in the tornado warning, should keep an eye on this storm. 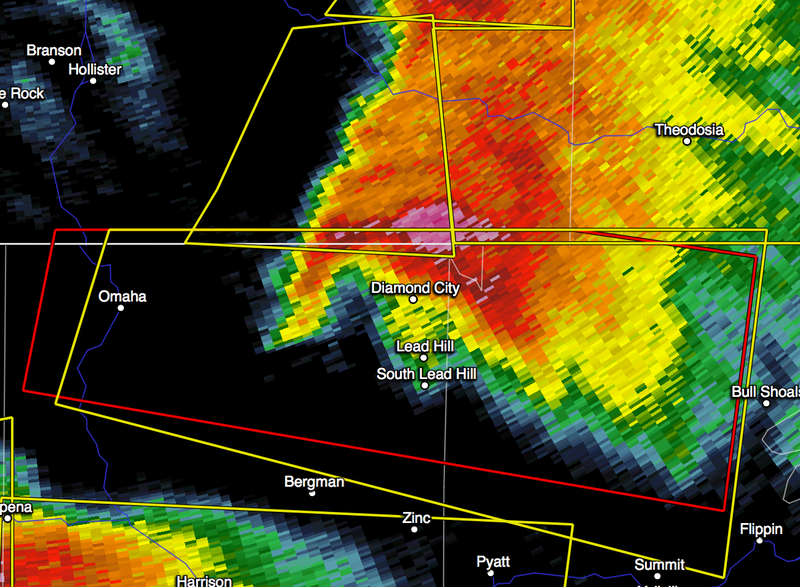 UPDATE: 7:02PM Diamond City and Lead Hill should be in shelter now! 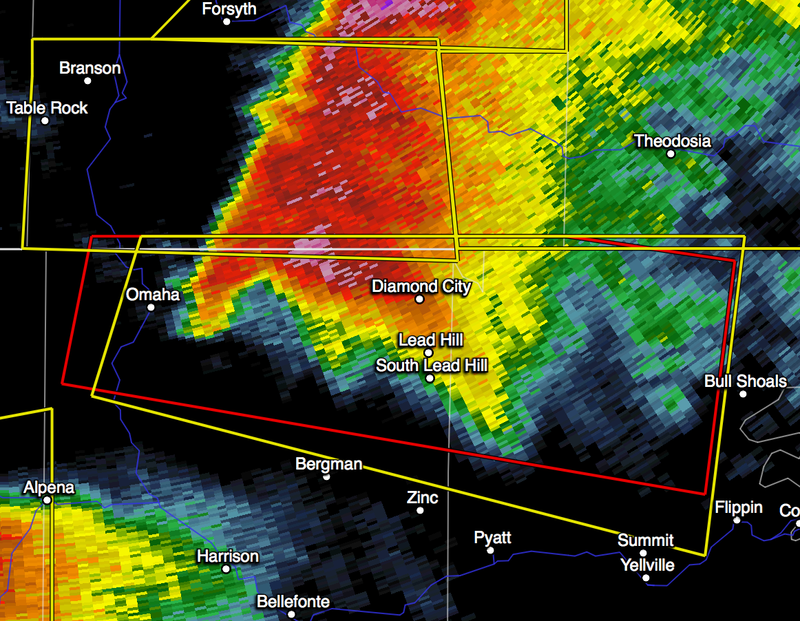 Tornado warning for parts of Boone and Marion counties in Arkansas. 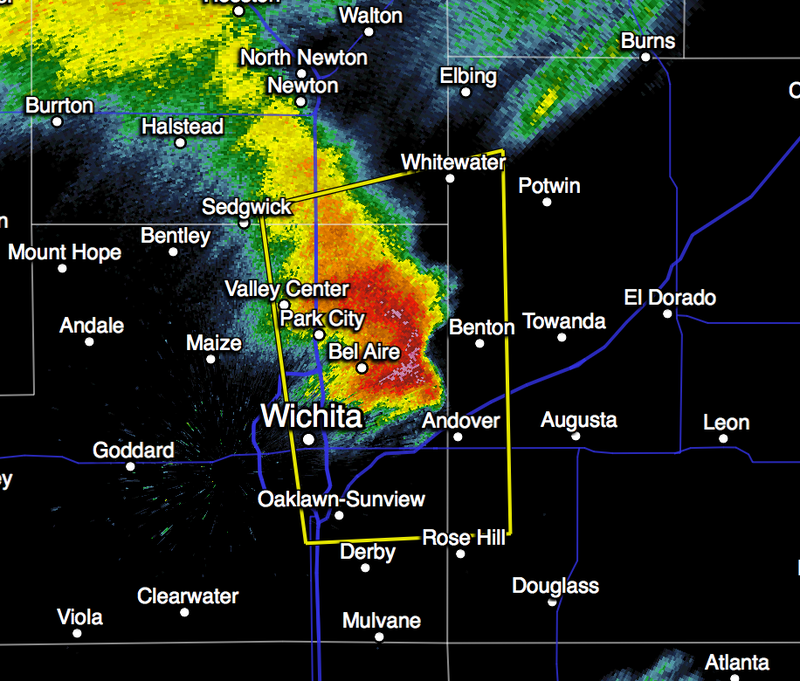 Diamond City, Lead Hill and South Lead Hill should take immediate safety precautions as this storm moves ESE. The tornado warning is the red polygon. Especially in the Ozarks, it is a good time to put your car in the garage and put away anything that can be damaged by large hail. There is a pretty good chance of it developing after about 3pm and continuing into tonight. Here is the show if you would like to see it. The show actually begins at about the 10 minute mark on the video. My contribution begins about 19:30. Enjoy! I'll be on @WeatherBrains this evening. Click on the link if you'd like to watch/listen, starting at 8:30pm CDT. Does President Obama Believe What He Says About Global Warming? (CNN)-- What President Barack Obama described as the greatest threat to future generations was neither terrorism nor ISIS. It wasn't nuclear weapons in rogue states either. The answer to the question posed in the headline is, "apparently not." President Barack Obama may have found the perfect place to soothe away the stresses of eight years in office after it emerged that one of his closest friends and a major political fundraiser had organised the purchase of an iconic beachfront house in Hawaii. As was the case for the Dallas home of former President George H W Bush and New York home of the Clintons, these types of transactions are often handled by, or with the assistance of, third parties. 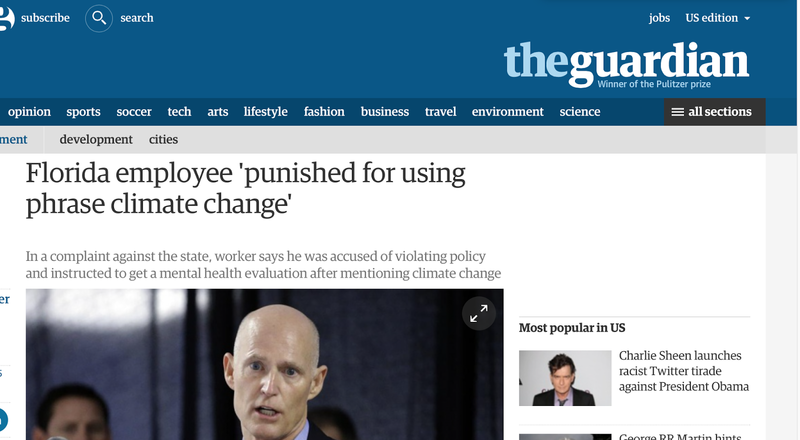 "I'll believe global warming is a crisis when the people telling me its a crisis start acting like its a crisis." 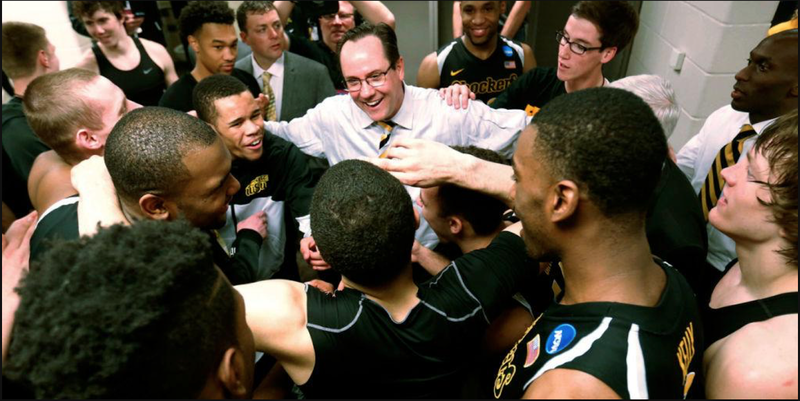 Congratulations to Coach Gregg Marshall and the Wichita State Shockers in their victory over Kansas this evening. 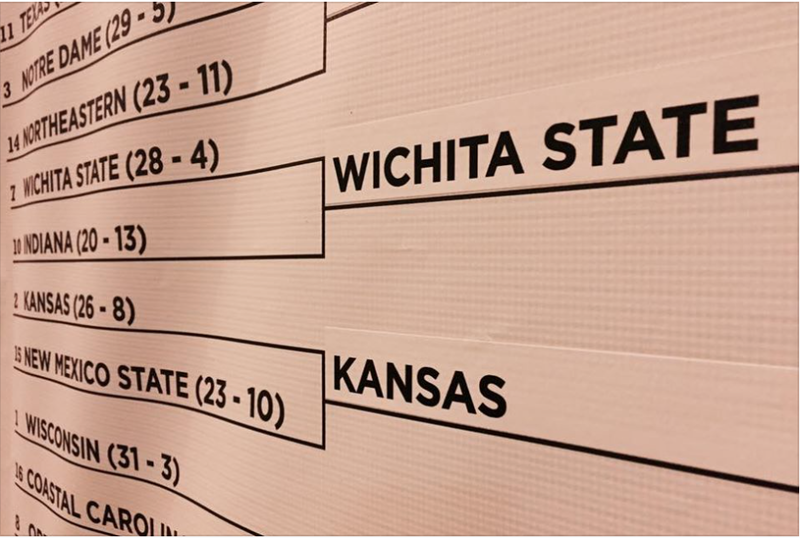 They take on Notre Dame Thursday evening at 6:15pm CDT on CBS. 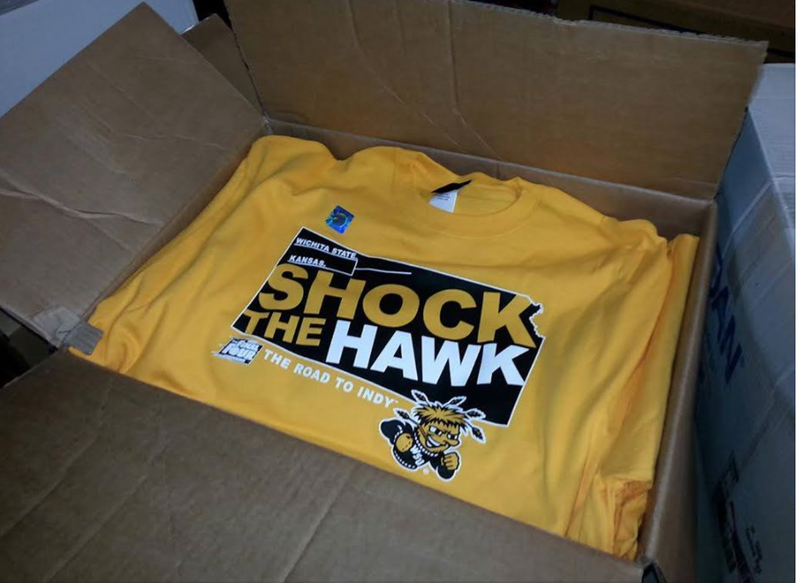 Go Shockers!! This is the big day. As I understand it, the Hawks are a one point favorite. Regardless of what the coaches and players say, this game means much more than the average game. 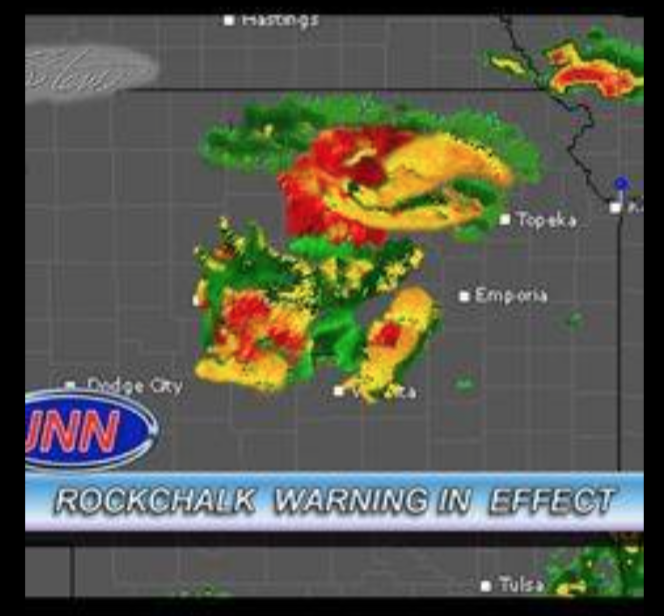 People throughout Kansas are passionate about their preferred team. So, from about 4pm CST to 6:30 (barring overtime), give your Kansas friends and relatives a break and call earlier or later. Last week, we featured the installation of my model train layout. Friday, the Wall Street Journal had an article about a Chicago-area layout built by a third party as part of a story about "man caves." I thought it would be fun to compare. My comments are in brackets. Men who like to tinker with old radios, model trains or antique toy cars have traditionally been banished to a worktable in the corner of the basement [attic room]. But for Chicago-area retiree Tom Frattinger, 69, the hobby room is a point of pride. 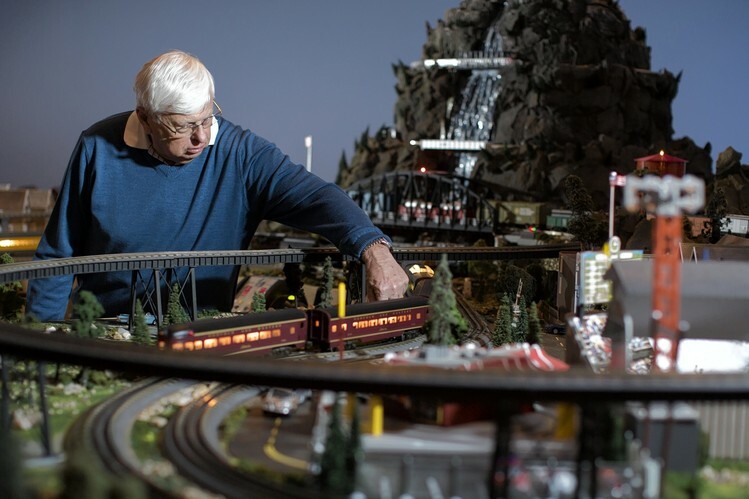 Mr. Frattinger declined to say how much the setup cost, but according to Mrs. Silets, her company’s model railroads start at about $35,000. Sprawling atop a large raised platform, Mr. Frattinger’s train set combines a rural small-town tableau and mountain scenery with a Chicago-inspired urban [Kansas-inspired] setting that includes replicas of Wrigley Field [the Keeper of the Plains], a model carwash [my family's Ford dealership] and a McDonald’s restaurant [yes! ], as well a stretch of elevated track running in loops around a mountain peak complete with a waterfall. 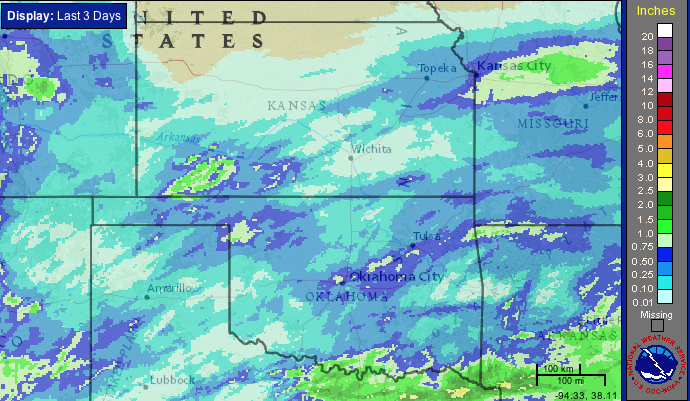 Showers were prevalent across the winter wheat belt the last three days but amounts were generally light. Much more rain is needed as the wheat breaks dormancy. For my friend, Ginger Zee, Go Valpo! Yes, that is Ginger in the center below. Dr. Marshall Shepherd gave his students their thermodynamics test yesterday. This was the review board. As a friend of mine (with a BS in meteorology and an MBA in marketing and a private pilot) says, People think meteorology is easy. It is really very, very hard. ABC Philadelphia Meteorologist Cecily Tynan: To those who ever complained about meteorologists busting a forecast, let me know the outcome of your bracket. 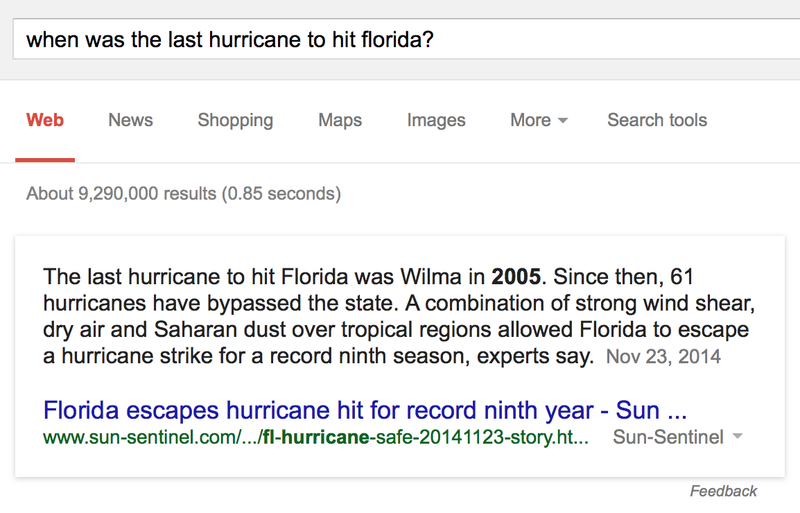 The actual amount of hurricane damage to Florida since 2005? Zero. See below. 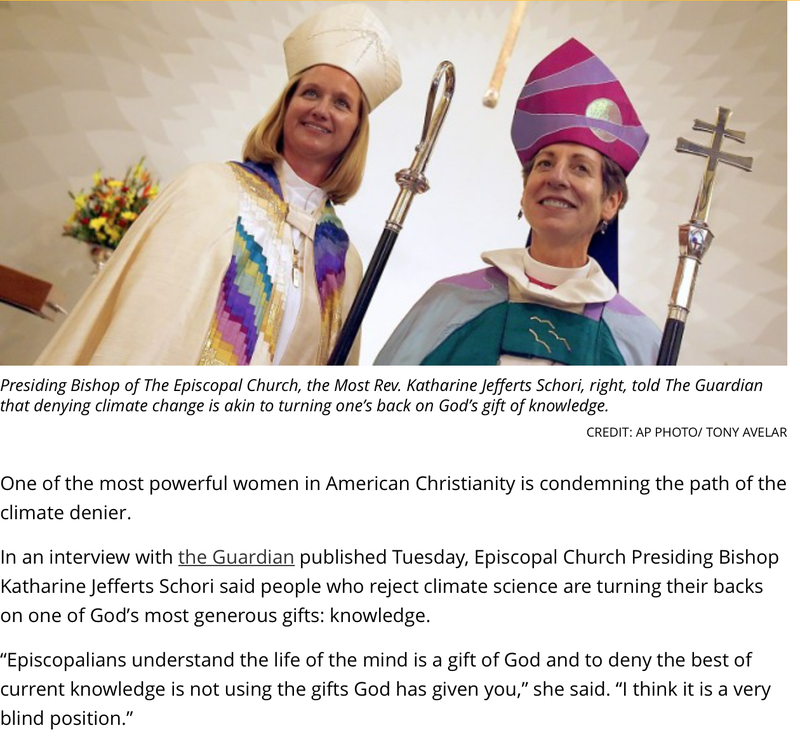 As the science around catastrophic global warming crumbles, the climate cult gets more and more desperate. Unfortunately, the media seems determined to be witting or unwitting accomplices. 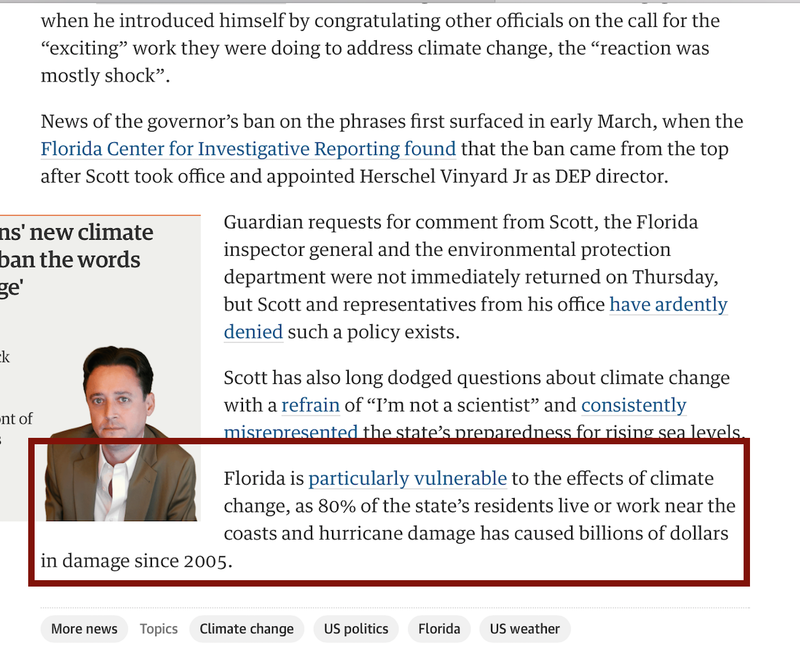 * For a more technical explanation of the latest blow to catastrophic global warming than at the purple link, go here. As Dr. Judith Curry describes it, this latest research is a "game changer." AccuWeather Wins Microsoft Visionary Award! "Fossil Fuels Will Save the World"
Debut of The AccuWeather Network! Think 'Green' Energy is a Good Idea? Think Again! "And, That's the Way it Was"
"What We Have is a Faulty Distribution System"
Keep an Eye on Your Pets!